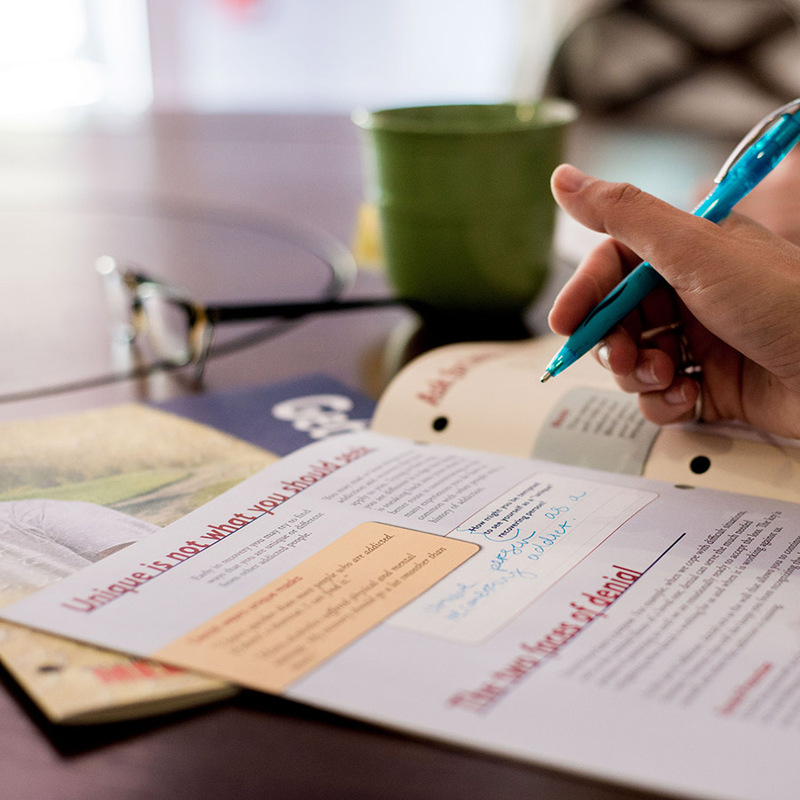 Interactive Journaling® guides participants toward positive life change. Through a structured and experiential writing approach, Interactive Journaling® goes beyond standard educational materials and resources to make the individuals the center of their own change process. This innovative, evidence-based methodology was developed with the assistance of over 250 professionals in the health and human services field. To date, Interactive Journaling® has impacted over 25 million people nationwide. The Change Companies® can create a custom Interactive Journal that meets the specific needs of your organization and clients. As with our other products, customized Journals use the highest-quality print and digital production process and include your name, logo, colors and unique message. Interactive Journaling® incorporates evidence-based practices that effectively assist individuals in making positive and lasting life changes. These include motivational interviewing, the transtheoretical model of behavior change, structured expressive writing and cognitive-behavioral therapy. The Change Companies®' materials help BI Incorporated provide high quality, evidence-based programming at affordable prices all across the country. The customization they offer — and our ability to mix and match Journals to put together our own program — is outstanding. I've been in this field for 18 years, and when I first saw My Personal Journal I just loved it! The Change Companies® was very helpful and made it easy to access. We love it because it covers every major area of treatment that we try to cover. We have developed our treatment plan around it. It makes it easy to do charting and when JCAHO and CARF come in, they just think it's great - everything is so clearly documented. The Change Companies® has proven to be a knowledgeable, flexible and reliable partner with us in developing standardized DUI education programs. They listen to our needs and tailor services that make sense for us. Their participant workbooks bring structure and consistency to all of our programs. The Change Companies® has developed a wonderful array of tools for helping individuals get their lives on track. I believe that Interactive Journaling® is a powerful way to help individuals gain awareness of their thoughts, reactions and values, and from this basis, to make commitments within themselves to change. I want to recommend The Change Companies®' Interactive Journal products highly. But also, I want to share with you how delighted we have been with the custom editing service for text and graphics, as well as their excellent customer service and support. The Wisconsin Technical College System's partnership with The Change Companies® in the development of standardized curriculum has enhanced the quality of our impaired driving, underage and traffic safety programs statewide. We have had a lot of positive feedback from the officers, as well as the clients, on the journaling system…our clients are actually looking at their future instead of just living moment to moment or day to day. They are really thinking about what they are doing and are able to put together that what they have been doing is NOT working and it is time for a change in thinking.